Some of my favorite moments with Sunday. Nothing drastically new here, although things do feel a little different since last summer. I like the repetition and routine still. Getting to the farmer’s market early and experimenting with produce; wandering Dupont feels pretty much the same; trying new coffee beans and trying to remember what I like and why; reading…sometimes fiction [The Interestings], sometimes for work [Creating Magic], sometimes stacks of food magazines; repeating playlists with favorite songs from Urban Cone, Smallpools, CHVRCHES, Tanlines, James Bay, Of Monsters and Men; then ending with cooking some pasta for dinner. Mostly I eat alone while making to-do lists for the week ahead. Every so often I let someone in on this, which probably means much more to me than to them. My roof is a lovely alternative setting than my couch if weather permits. Soaking up the final moments of calm, collecting creativity for later in the week. 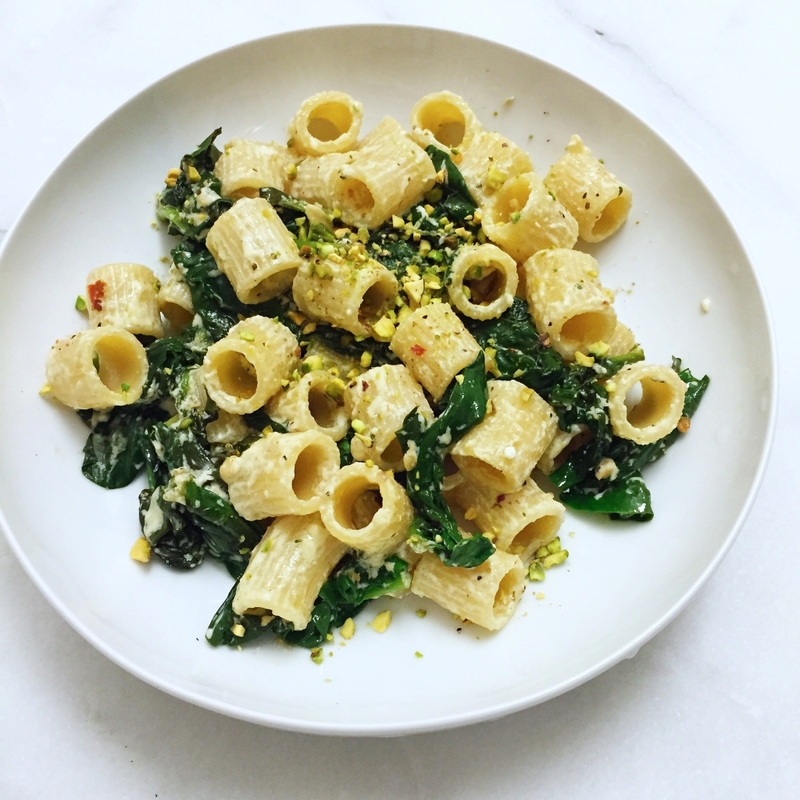 This was one of my most favorite pasta recently: leafy farmer’s market spinach, creamy goat cheese, crunchy pistachios, bright lemony flavor. Satuée spinach with garlic in olive oil til wilted. Add cooked pasta and a little reserved pasta water. Stir in goat cheese til pasta is coated evenly. Squeeze in a little lemon juice if you’d like. 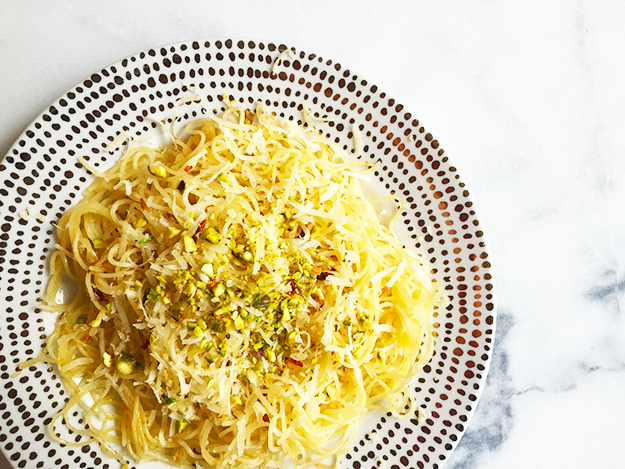 Top with crushed pistachios and cracked pepper. Eat this outside. With Urban Cone “Weekends” playing. Read the Vacationers. Snapchat a pasta pic your crush to make them jealous. A glass of rosé is necessary too. Enjoy dinner, this time…it’s all yours. Posted June 15, 2015 in Recipe by Nikki. This is what a good weekend looks like. Pasta and wine out with friends at Cashion’s. Lazy mornings in bed. Fresh fragrant roses. Reading a great quick book with a cup of hot chocolate in hand. Eating more pasta while watching a movie. 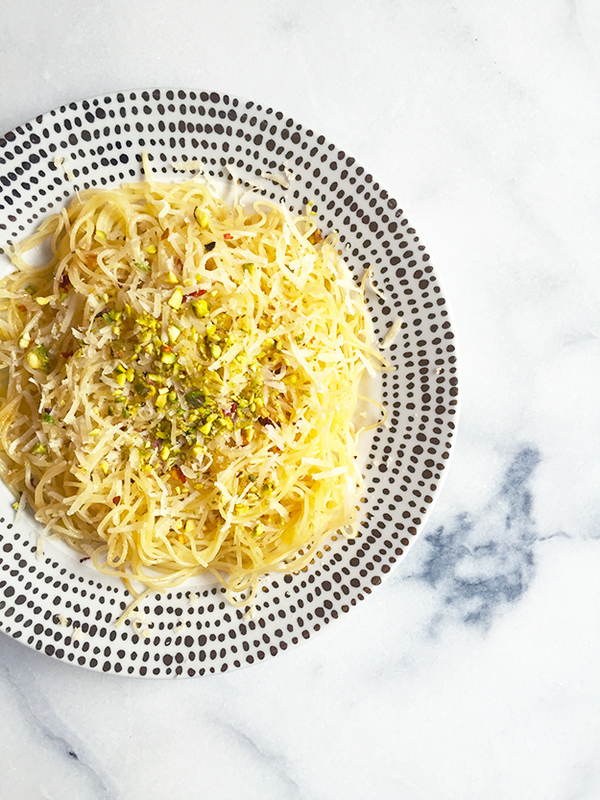 This time: capellini with hot pepper oil, egg, parmesan, crushed pistachio. This is my idea of a perfect weekend. Something that doesn’t happen enough. But I love how it transports me. To a quiet place of reflection. To Paris – books and movies that allow me to be there. To the kitchen where I can experiment with simple ingredients to make something new. These are my favorite places for my mind to go. Wandering, dreaming, creating. And I so appreciate these small weekend moments to get there. Cook olive oil in a hot pan with red pepper flakes and minced garlic. Toss with hot cooked pasta, an egg yolk, and pepper. 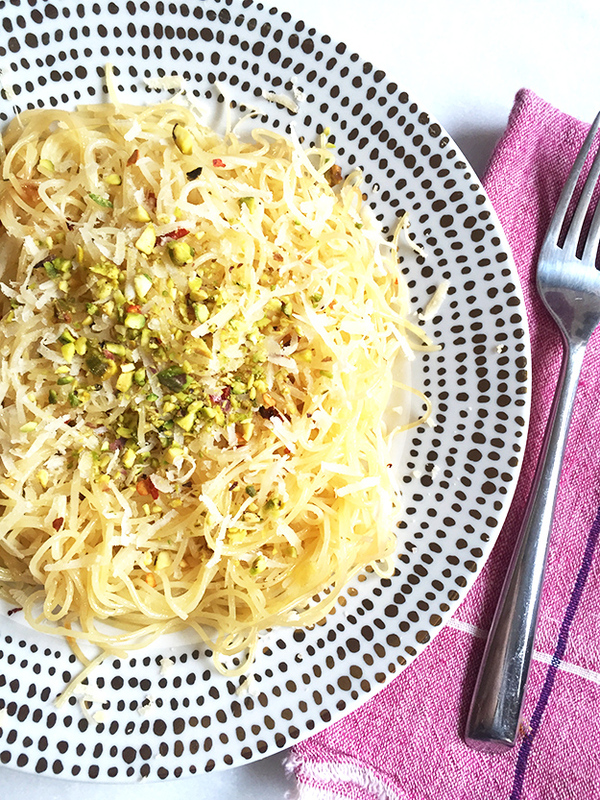 Top with grated fresh parm and crushed pistachios. Eat in heapfulls. Posted January 21, 2015 in Recipe by Nikki. I’ve always been a pasta girl. 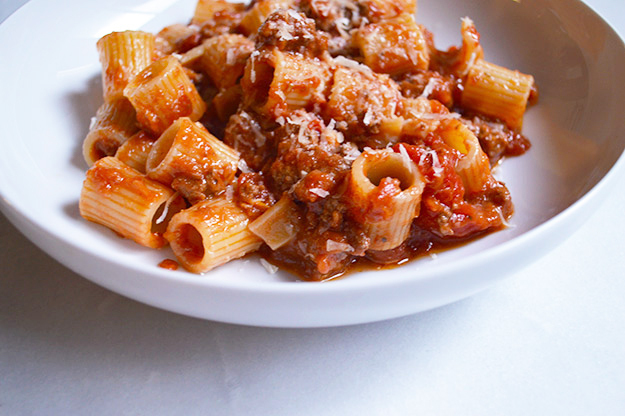 My favorite meal growing up was rigatoni in red sauce. With a glass of milk. 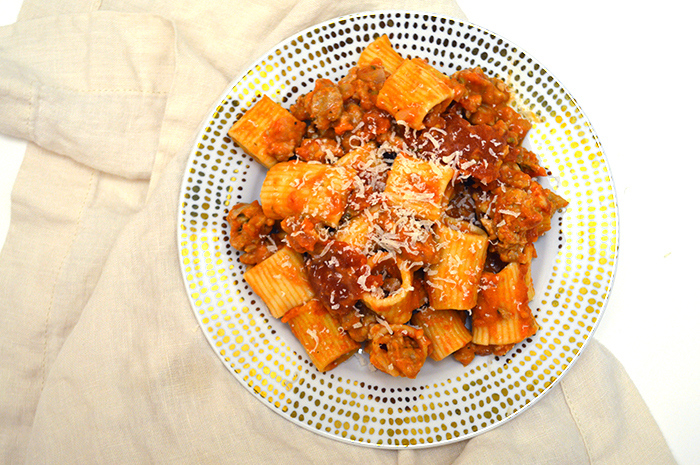 Sometimes my mom added chicken to the rigatoni, creating “chicken and pasta” and my most requested dinner dish ever. Mom’s pasta masterpiece. Wanting to recreate it recently, I asked her about how it was made and she just laughed. No recipe. Sauce out of a jar of course. But the good kind. Never Prego. Maybe she baked the chicken? And then just added it to the pot of pasta and sauce? As few dishes to wash later as possible. Possibly every time she made it, it was a little different, she said. But I didn’t notice. 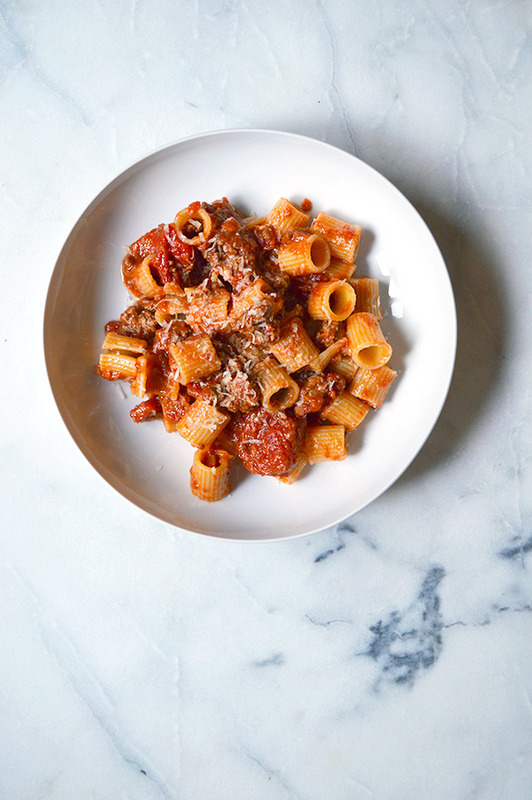 Cause I loved rigatoni and red sauce. Today I love that it seemed so effortless to her. I’m sure it wasn’t. My mom the most dedicated and hard working woman…she taught me what hustle is all about. And how to love it too. She didn’t always have time or energy to make dinner (nor should she), but when she did, and it happened to be one of my favorite meals, I know she loved the work. Well this Sunday I had time. To grocery shop. To let my sauce simmer. To chop an onion. To drink a great glass a wine and dance around to LFO while cooking. To taste as I was cooking. To actually eat with someone else. To do all the dishes. Ok, I didn’t make the grilled caesar salad to go along with it or sit at a real table to eat. But just like mom, I can’t do it all, but I can absolutely squeeze in time for my favorite meal, and a little feel-good, during a crazy week. Since we never figured out the whole chicken part of “chicken and pasta” I added a mild Italian sausage instead. I probably wouldn’t have liked this when I was five. But I’m way into it at 27. In a dutch oven, sauté onion and garlic until onion softens. Add grated carrot. 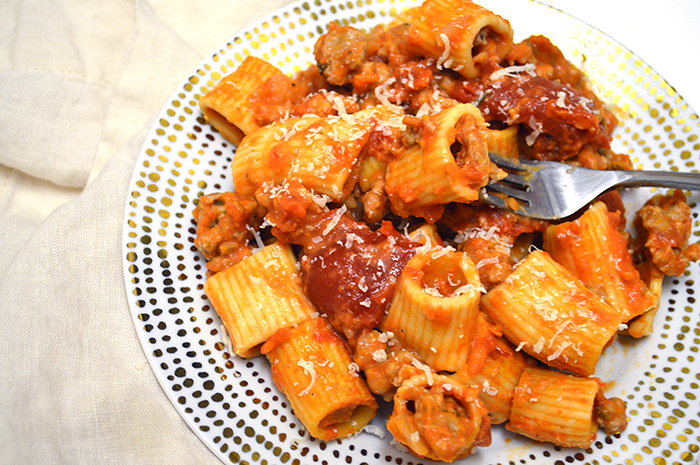 Open the casings of the sausage – I used mild Italian pork sausage – and satué until brown. Add herbs like rosemary and thyme + salt and pepper. 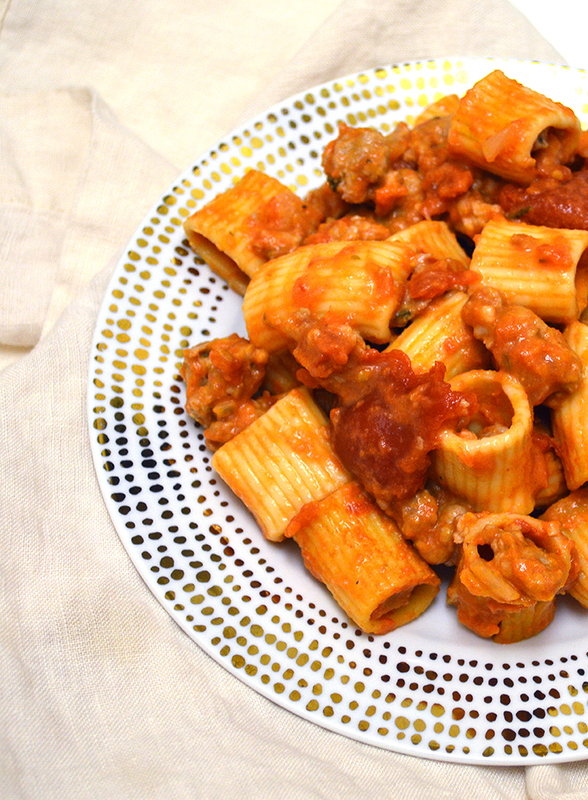 When sausage is browned, add several cans of whole peel tomatoes to the pot. 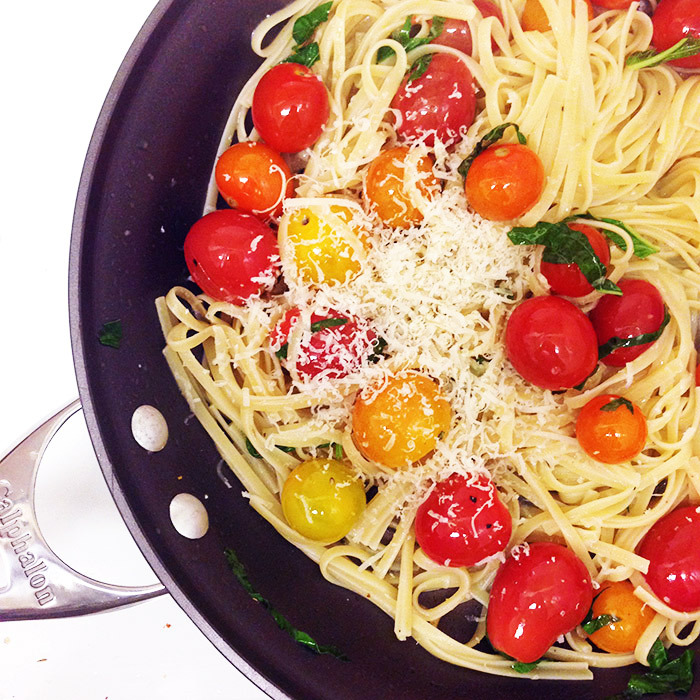 You could cook this all afternoon or just 30 minutes until the tomatoes have broken down. Add a splash of red wine and heavy cream. 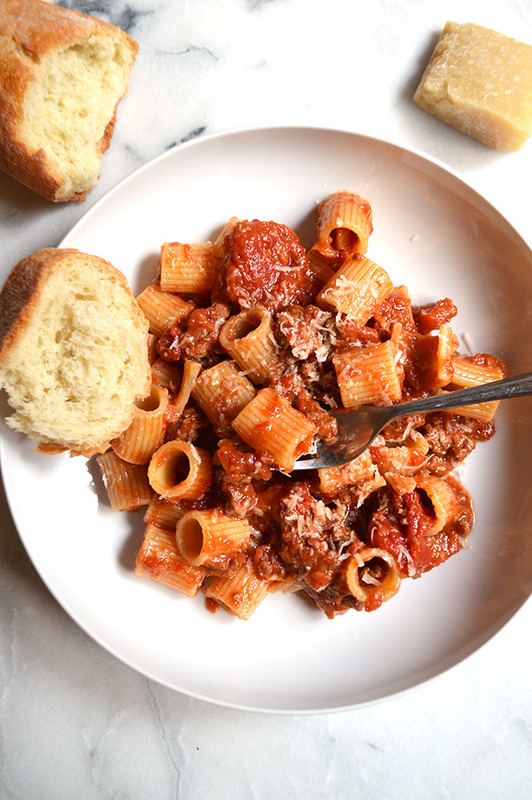 Toss with cooked rigatoni and grate fresh parm on top. Posted October 21, 2014 in Recipe by Nikki. This one’s for the tomatoes. The ones that are so ripe right now they can be popped in your mouth whole or bit into like an apple. 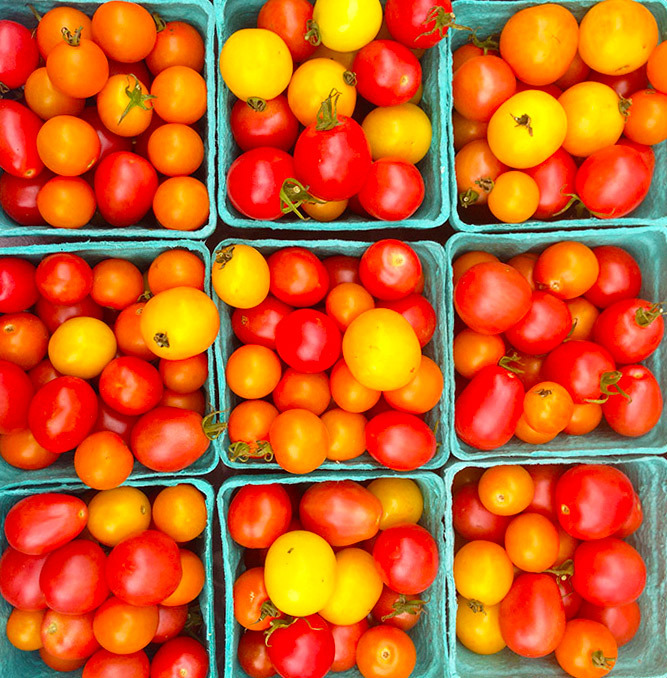 Even though I’ve already bought two new pairs of boots and a couple new sweaters, these tomatoes make me realize I want to slow summer down. Don’t forget to go to the market this Sunday. What haven’t I made yet? How can I savor these longer? The taste of late sunsets, feeling carefree, getting your hands dirty, everyday celebration. This is an easy one…. In a large pan, sauté tomatoes in olive oil and garlic until blistered. Make fettuccine. 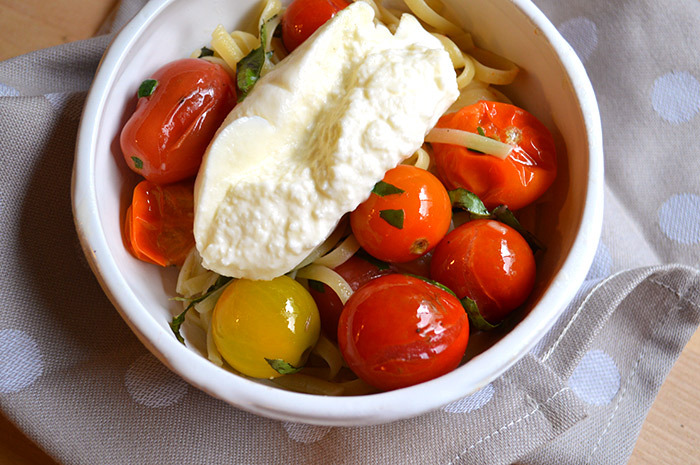 Toss the fettuccine and some pasta water with the tomatoes. Add ribbons of fresh basil. Top with burrata. Stir together. Serve with rosé and savor. Posted August 27, 2014 in Recipe by Nikki.